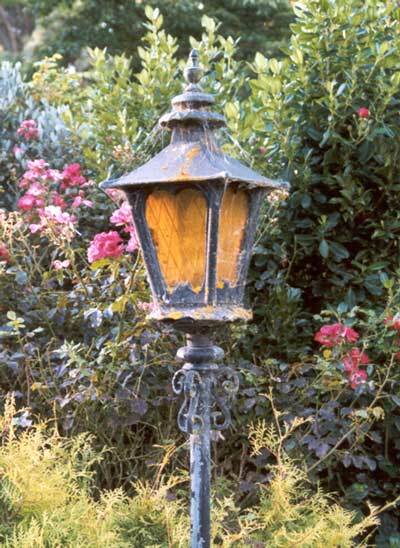 The lamp which sits in the corner of the garden by the car lay-by is the only outdoor light in the garden. It's never cleaned because of its resident spiders. I like to keep my garden spiders happy. Neighbouring shrubs are a conifer, a large bush rose, and a camellia. In this original photograph you will just see tendrils of the golden green conifer underneath, and a red rose, past its best, flowering alongside. And you can imagine the happy spiders who have set up home, ready to catch those annoying blowflies! This next picture was taken in the year 2004 - same conifer, different spiders. And the outdoors lamp can still function. 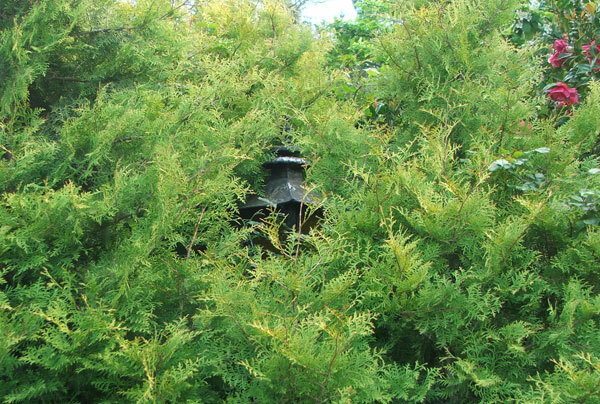 There has been some vigorous conifer growth, though, and it's harder to see the deep pink Camellia from the house in spring. But I atill like this conifer. In winter it creates its own little bit of garden sunshine. In late spring the yellow and red rose Masquerade flowers on the pergola, and the conifer forms the perfect backdrop to show off these rose colours. 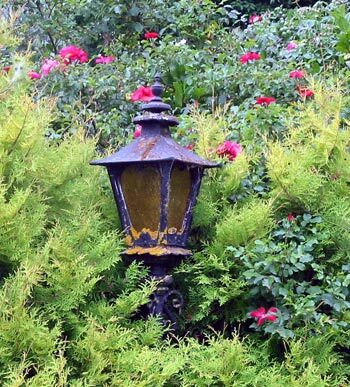 The conifer has always had two neighbours - a deep cherry-pink camellia in spring, and later in summer a large cherry red rose. You can see this rose flowering in the 2001 and 2004 photographs. I look forward every year to the colour combinations. I enjoy gardening with spiders. In their defence, I'd like to say that they do a great job around the outside of the house - and I try to live in harmony with them. Oops. What else can I say? Oh dear. Something had to be done. By now the conifer had spread itself badly out of shape, and the spring snow storm in August 2011 finished it off, in my eyes at least. Too late for any judicious trimming, down it came at ground level. Sorry about that! 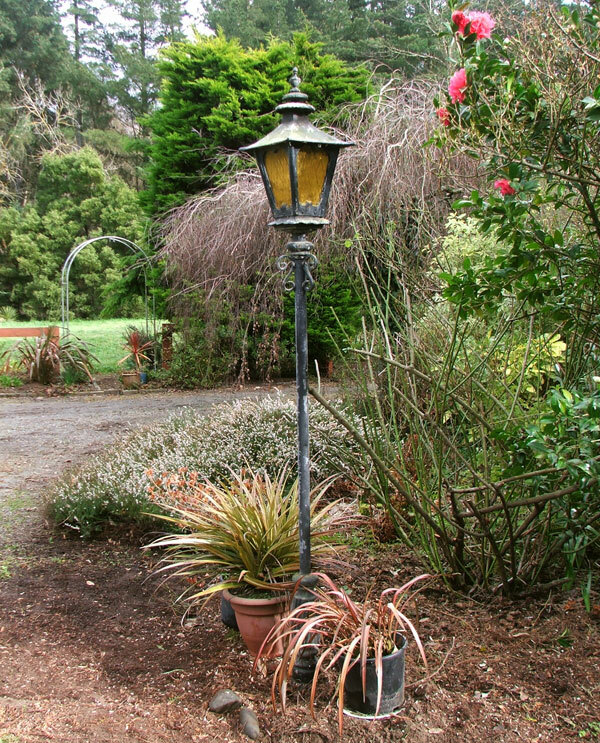 So here's the outdoors spider lamp, proudly bare, with the original light bulb still working after all those years. Welcome back!